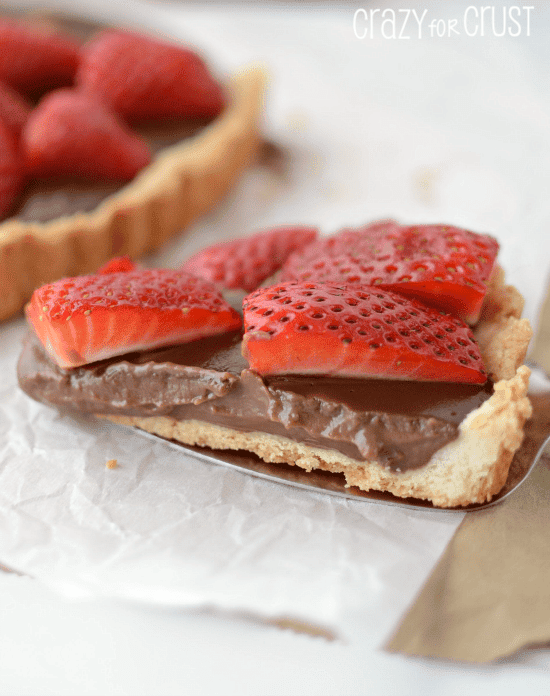 If you love Nutella, you’re going to love this Nutella Strawberry Tart. A shortbread crust is filled with a Nutella pudding and topped with fresh strawberries. It’s a chocolate lover’s dream! Oh my God you guys. I made heaven. Seriously. Nutella Strawberry Tart. Do you love Nutella as much as I do? I have to hide the container in my cabinet so I don’t attack it with a spoon. 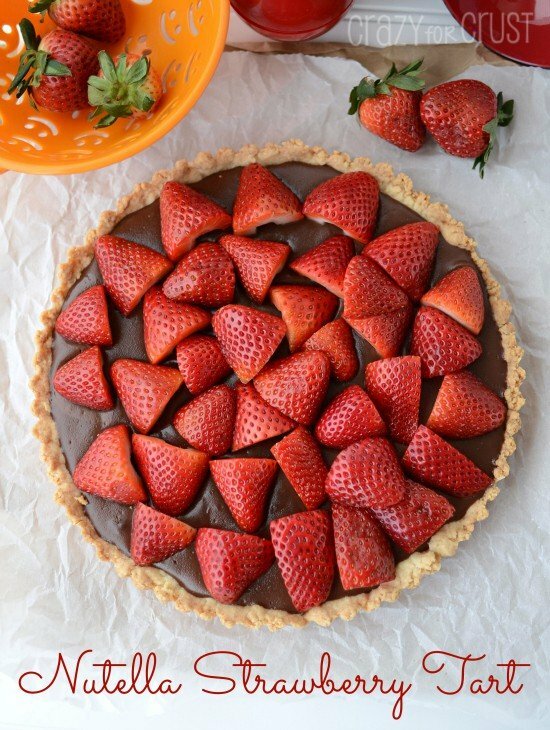 This Nutella Strawberry Tart is full of Nutella pudding. And it’s topped with strawberries. I love chocolate and strawberry together. It’s my favorite way to eat fruit, if we’re being totally honest. On Easter we went to a buffet and they had a chocolate fountain for dessert. You know what that fountain got me to eat? Pineapple. Something I won’t normally touch with a 10-foot pole. So, yeah. Chocolate + Fruit is totally acceptable. And the crust. The CRUST. You guys – it’s shortbread. So, let’s put it all together into one Nutella Strawberry Tart. Shortbread Crust + Nutella Pudding + Strawberries = Heaven. Am I right or am I right? The crust for this Nutella Strawberry Tart is super easy to make. You all know how much I hate rolling, right? It’s up there with dipping? And being patient? So I made a shortbread crust (the one I made Apple Butter Pie Bars with) and I pressed it into my tart pan. The only difference between this crust and that other one is that I used cold butter. And my food processor. I took this picture because if you make this Nutella Strawberry Tart you’ll probably think there isn’t enough dough to fill the whole tart pan. You have to press and press and press. But this is proof – there is enough dough! 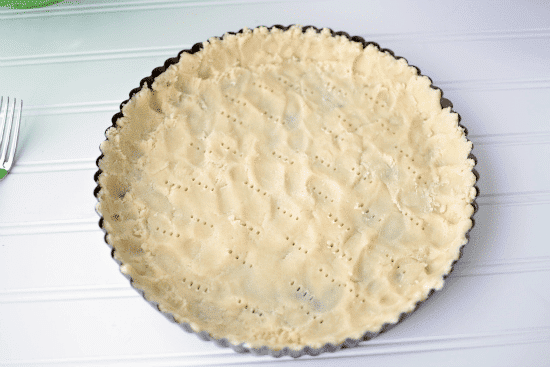 You’re going to pre-bake the tart shell, so you want to prevent bubbling. You can use beans or pie weights. I prefer a fork. Prick the bottom of the tart several times with the tines of a fork before baking. No bubbling! Bake and cool your tart. Then comes the fun part! I made my Nutella Strawberry Tart filling using my new favorite kitchen tools from Kizmos. You remember them? A few months ago, I made a White Chocolate Macadamia Magic Pizza using the fun and smiley Kizmos tools. I cut the pizza with Bob, my pizza cutter, and opened the can of sweetened condensed milk with Chrissy, the can opener. And, Kizmos has possibly the cutest kind of measuring cups ever: Nesting Measuring Cups. Think Russian Nesting Dolls…but measuring cups. It’s like a toy that’s also a measuring cup. Those of you with toddlers and young children will delight in using them. 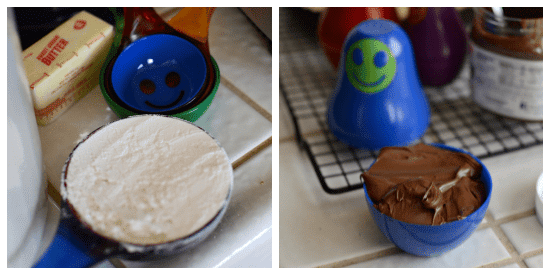 The Nesting Measuring Cups were perfect for measuring out the Nutella – deep and wide so that I could get a small spatula inside to dig it all out into the pan. And, possibly my favorite Kizmos product: the colanders. They smile at you while you clean your produce. How adorable is that? I still haven’t named my new Kizmos products. What do you think? I think the purple colander looks kind of like a Kimmy. What do you think? Okay, so let’s talk Nutella pudding, mmkay? Best. Pudding. Everrrrr. You heat your Nutella, milk, salt, and extracts in a pan to melt it. I used a combination of vanilla extract and hazelnut extract, because I had it in my pantry. You can skip the hazelnut if you don’t have it. Then you thicken the pudding by adding more milk that has been mixed with cornstarch. This is an egg-free pudding! Who knew? The Nutella Strawberry Tart comes together super easy and fast. Simply pour into the tart shell and chill and you have a gorgeous dessert. I added the strawberries right before serving. 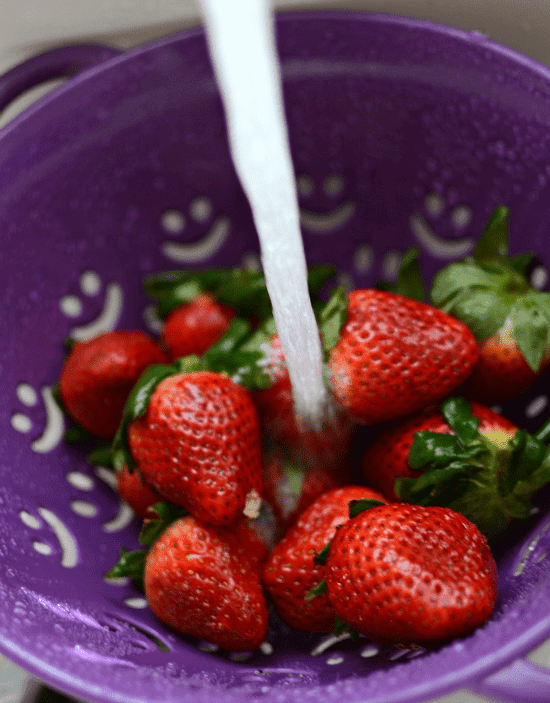 I suggest you do that too – day old washed strawberries just aren’t quite…right. If strawberries don’t look good at the market, you could also do this with raspberries. That would be just as good! 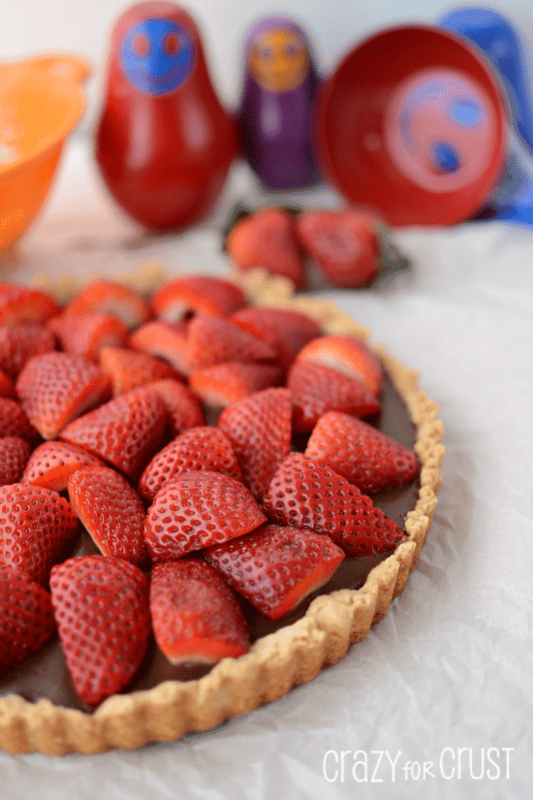 If you love Nutella, you're going to love this Nutella Strawberry Tart. A shortbread crust is filled with a Nutella pudding and topped with fresh strawberries. It's a chocolate lover's dream! Pulse flour and sugar in a food processor. Add diced butter and pulse for about 20-30 seconds, until the butter is broken up. Add the vinegar and run until dough comes together in the machine. Turn dough out into a 10” tart pan with a removable bottom. Press with your hands up the sides and across the bottom. It will seem there isn’t enough dough - but there is, just keep working it! Poke the bottom of the tart several times with a fork. Bake for 20-23 minutes, until it just begins to brown. Cool before filling. When ready to fill the tart shell, make the filling. Whisk the cornstarch into 1/4 cup milk in a small bowl. Add the remaining 1 3/4 cup milk, Nutella, salt, and extracts to a pan. Whisk over medium heat until the Nutella melts, then whisk in the cornstarch mixture. Bring mixture to a boil, stirring constantly with a rubber spatula. It will start to thicken. Once the mixture starts to boil, stir constantly until fully thickened, about 2 minutes. Pour into the crust. Refrigerate until set, about 1 hour. Top with strawberries before serving. Store in refrigerator. I love Nutella so much that I can’t get enough. I love making things like Nutella Chocolate Pudding Cookies or Peanut Butter Nutella Nutter Butter Pie and I’m obsessing over Nutella 5 Chip Cookies by What’s Cooking with Ruthie, Banana Monkey Bread with Nutella Ganache by Wine & Glue, and Nutella Kiss Cookies by Something Swanky. This is my wife’s favorite. I always make it for special occasions. Making it tonight for New Years! I find that I have to add a little extra vinager to get it to come together.